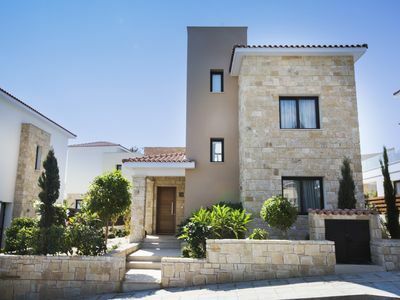 SANTAMARINA luxury holiday villa in Paphos, is centrally located just off the coastal road between Kissonerga and Coral Bay, near the Mavrokolympos Dam offering beautiful sea views. Upon entering the villa, you will be swept away by the amazing seaviews through the large glass sliding doors. The dining area is tastefully furnished with a wooden dining table comfortably seating up to 12. The adjacent living area is equipped with matching sofas in warm colours and a wooden coffee table. The living area features a bar with wine cooler and sound system from which you can play songs directly from an external hard drive or USB stick. 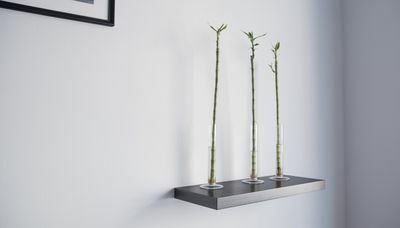 For entertainment you will find a flat screen TV with satellite channels and DVD player. 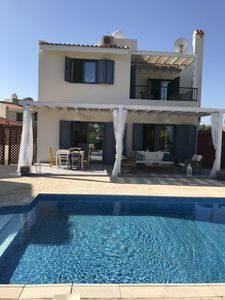 The villa also offers the luxury of a wireless internet connection. From the dining area you can enter the kitchen area which is separated by a small wall with a built in double-sided wood burning fireplace. The kitchen area features a small breakfast area with table and 6 chairs where the large glass sliding doors offer a light and airy atmosphere. The villa offers 2 adjacent kitchens. The first kitchen is a large fully equipped kitchen with a breakfast bar and 3 bar stools. The second kitchen is a smaller kitchen which offers a 5 ring gas hob, dishwasher, toaster and kettle. Here you will also find a small utility area with a washing machine and clothes dryer. On the ground floor you will also find the first bedroom of the villa, a double bedroom. This bedroom has access to the ground floor separate shower room. Moving down to the lower ground floor is a large spacious games-room, offering hours of entertainment for all ages. The area features a ping pong table, pool table and table football, children’s play area with a small slide, seesaw and pop up tunnel and tent and a blackboard. The remaining part of this spacious area is dedicated to relaxation with 2 comfortable sofa beds (suitable for 2 children), coffee table and a traditional TV set with PlayStation 2. Moving up to the first floor, the first thing you will see is the amazing sea view offered by the large glass sliding doors on the landing. 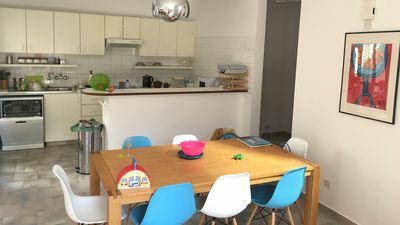 Here you will find a comfortable sofa bed (suitable for a child) and a small kitchenette with a mini fridge. 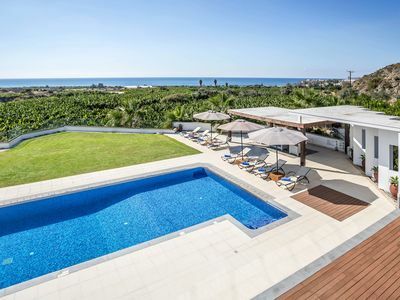 From this landing the large glass sliding doors lead the way to a balcony equipped with lounge furniture for you to enjoy an evening drink whilst enjoying the views of the sunset over the Mediterranean Sea. Also located on the first floor are 4 further bedrooms. Symmetrically located around the landing you will find on each side a master bedroom as well as a twin bedroom. The 2 master bedrooms of this villa are double bedrooms with floor to ceiling glass windows offering you the superb views of the Mediterranean Sea as you open your eyes in the morning! Both of these bedrooms have the luxury of a walk in wardrobe as well as a small dressing table and chair. Furthermore each of the master bedrooms have the luxury of an en suite bathroom with sunken bath and separate shower. 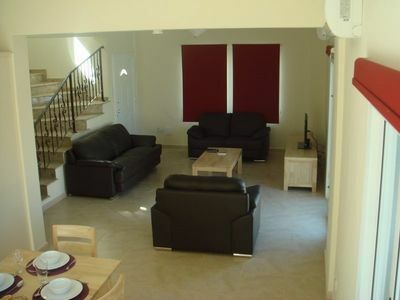 The remaining 2 bedrooms are twin bedrooms both with the luxury of an en suite shower room. From one of the twin bedrooms you also have direct access to a large terrace from which an exterior stair case leads the way up to the roof terrace. 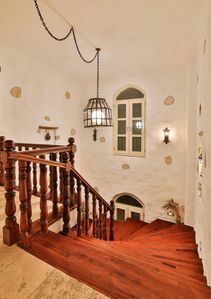 From the front of the villa an external stair case leads the way down to a very large lawned area with fruit trees and a wooden swing for the children. 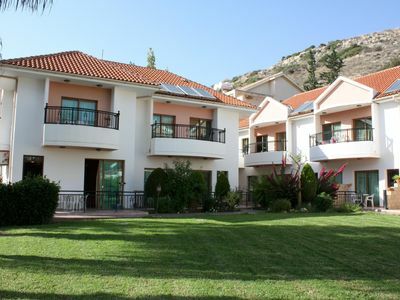 From this area you have direct access to the studio apartment of this villa. The studio offers a double bed and has the rare feature of a high-rise children’s bed. A sofa bed suitable for a child is also available. The studio has a small kitchen with 4 ring gas hob, oven, extractor hood, fridge/freezer, toaster and kettle. A small breakfast area is available with a table and 4 chairs. 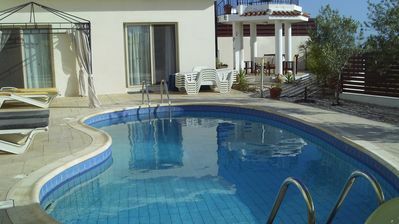 The villa is air conditioned throughout via a central system and the studio offers an air conditioning unit. A baby cot and highchair is available upon request and a hairdryer is available in each of the master bedrooms.? The large area to the rear of the villa features a wooden deck equipped with tables and chairs seating comfortable up to 14 guests. Adjacent to the wooden deck is the bbq area featuring an island with 4 chairs. For you to truly experience the joy of outdoor dining the villa offers an Australian bbq and traditional Cypriot bbq. A paved patio area surrounds the 10x5 swimming pool featuring walk in steps. The patio area is equipped with plenty of sun beds and umbrellas for you to enjoy a relaxing day in the warm Cypriot sun. A wooden pergola offers welcome shade and is equipped with a table and 6 chairs. Golden villa 28. Luxury, new 3 bedroom beach villa with private pool. 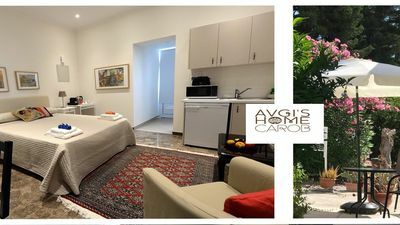 "CAROB STUDIO GARDEN APARTMENT" at "AVGI'S HOME"